There has been a widespread reporting of India’s economic woes and its systematic slowdown of growth. Both national as well as international media has slammed the Indian government for its short-sightedness regarding the nation’s economic future. But India Inc. has defied this slowdown and for the quarter July-September it has managed to create 1.36 Lakh new jobs in various sectors. If compared with last quarter, employment generation has increased 9%. In a recent survey conducted by the Economic Research Bureau (AERB) of The Associated Chambers of Commerce and Industry of India, it was revealed that Indian corporate sector is continuing to create jobs and the hiring outlook is very positive across all sectors. The survey, titled ‘Job Trends Across Cities & Sectors” was conducted by tracking over 3000 companies as they posted their job requirements across newspapers, online job portals and magazines across 56 cities and 32 sectors. – Among metros, Delhi was the top destination of job creators with 23.6% share. – With 58,000 new jobs or 42% share, IT and ITes (IT enabled services) was the highest contributor in job creation. Compared to last quarter, this share increased by 12%, which is a healthy sign of growth and progress. 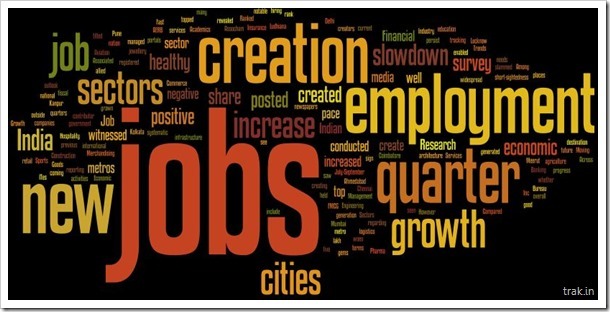 – Financial Sector ranked at #2 in creating new jobs across India. Banking, Financial Services and Insurance sector created 22,900 new jobs, which is an increase of 32% compared to last quarter. – Ranked #3 was Construction and Engineering with 7,200 new jobs creation. – Other notable sectors which posted positive growth in jobs creation include: Telecom, Civil Aviation, Pharma, Bio-Technology, FMCG (Fast Moving Consumer Goods), Energy, Hospitality, Advertisement, Event Management, Sports, Merchandising, Automobile, Research and Consultancy. While some cities did show slowdown, most of the other places registered positive growth. It’s good to see that even though there is a economic slowdown, the pace of job creation remains healthy. What needs to be seen is whether the pace of job creation will persist or will it fizzle out in coming quarters.